Leopard Print Luxury Satin Bedding Set Just $15! You are here: Home / Great Deals / Leopard Print Luxury Satin Bedding Set Just $15! 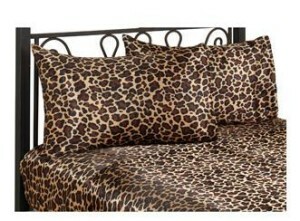 Head over to Walmart.com and get this Satin Luxury Satin Bedding Sheet Set in Leopard Print for Only $15 (reg. $24.88)! Set includes a flat sheet, fitted sheet, and 2 pillow cases. It is currently available for a Full or King. Plus, select Site to Store to avoid shipping charges.